Print Dead at Seal High! FRONT PAGE STORY! By Hilde Kate Lysiak Print is dead – at least at Selins grove High School. Journalism students at Selinsgrove say they would like a printed paper but there isn’t enough money in the budget, according to Selinsgrove journalism student Markie Reiland. “Its not good,” Markie told the News. “I really think having a print paper is important.” Selinsgrove High Superintendant Chad Cohrs told the News that it was a decision made by the staff because of “cost” and “timeliness.” “An electronic version can be done more frequently and with more current information than a paper version. For those who still want a paper version, I would suggest they hit the print button on their computer,” said Cohrs. Selinsgrove isn’t the only district that has gotten rid of its print edition. Milton, Lewisburg, and Danville have too. 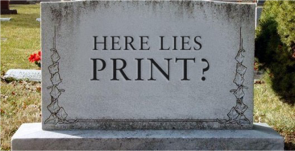 Joseph Kemp, a News Editor/Digital for the New York Daily News, says that while it is true that print is going the way of the dinosaur, he believes there will always be a place for good journalism. “Most people prefer to read and share stories on a digital platform, Kemp tell the News. “So really, a small article in a school newspaper has the potential of reaching billions of people across the world with the final push of a ‘publish’ button.” “It’s amazing!” said Kemp. This entry was posted on April 2, 2015 by Hilde Kate Lysiak and tagged Hilde kate lysiak, joseph kemp, new york daily news, Orange Street News, print is dead, selinsgrove, selinsgrove high school, superintenant chad cohrs.